Book Your Physiotherapy Online 24/7 Today! Physiotherapy is a discipline that helps restore movement and function when someone is affected by injury, illness or disability, this means we get things moving when restrictions are creating pain and immobility. 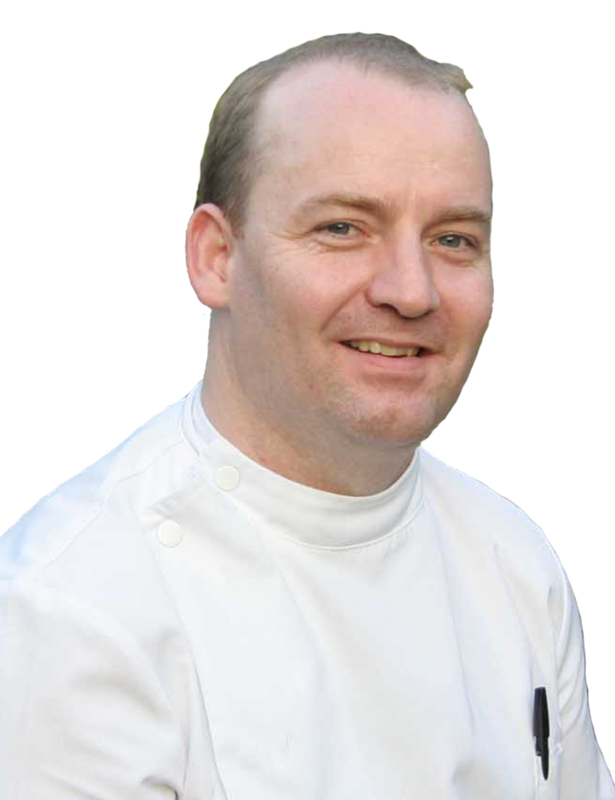 Physiotherapists utilise modules such movement and exercise, manual therapy, education and advice. Physio’s maintain health for people of all ages, helping patients to manage pain and prevent disease. As a practise physiotherapy helps to encourage development and facilitate recovery, enabling people to stay in work while helping them remain independent for as long as possible. You can benefit from physiotherapy at any time in your life. Physiotherapy helps with back pain or sudden injury, managing long-term injuries or helping to support at sporting event. The Chartered Society of Physiotherapy (CSP) is the professional, educational and trade union body for the UK’s 48,000 chartered physiotherapists, physiotherapy students and assistants. For more information on the CSP please visit The Chartered Society of Physiotherapy (CSP). 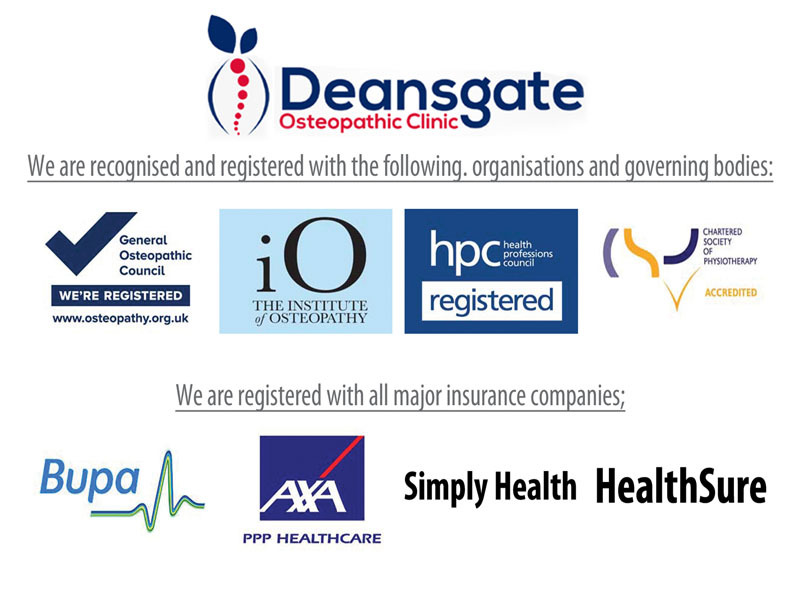 All of our Physiotherapists are registered with the Health & Care Professions Council. This is the regulator set up to protect the public. To do this, they keep a register of health professionals who meet their exacting standards for training, professional skills, behaviour and health. 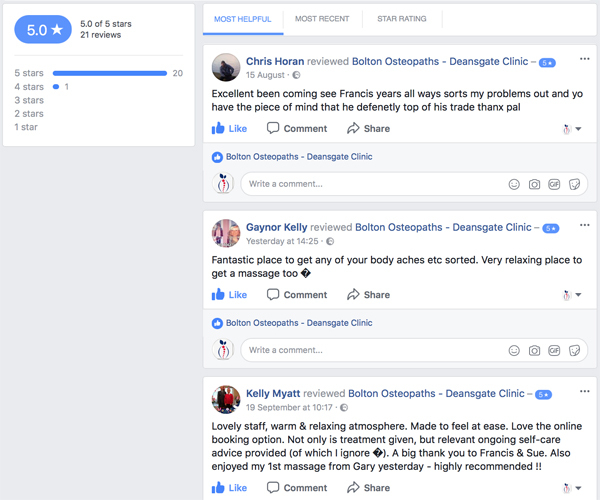 Here in Bolton we have male and female Physiotherapists ready to help you help you become pain free and moving again. If you are unsure if Physiotherapy will help you? Maybe you have had treatment before without the results? 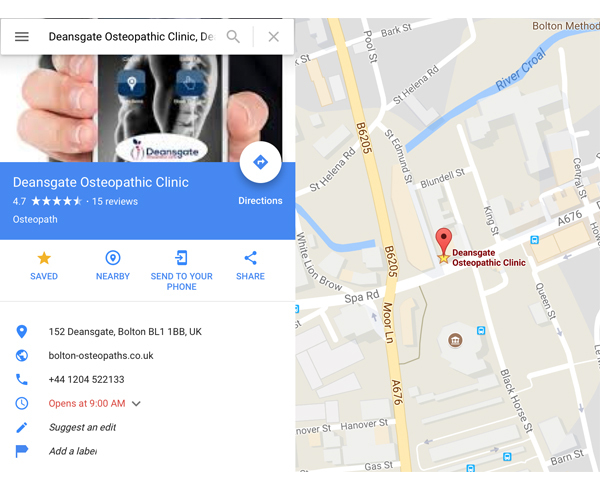 Maybe in the past you have been given a sheet of exercises or stuck on a machine for 20 minutes, here at the Deansgate Osteopathic Clinic we only have proven physiotherapist who will help you understand what we are doing and why and is a two way interaction. As mentioned our treatment will not simply involve talking you through exercises or leaving you on a machine, our treatment is based on getting your body moving in the most effective pain free way possible, utilising, massage manipulation, joint articulation and exercises. We will also look at your lifestyle influences such as working posture. If you have any questions please feel free to contact the clinic. Remember: Physiotherapy is not just about exercise!